Mertensia is a genus of mostly woodland plants known for their blue bell-shaped flowers. Virginia bluebells is the most commonly encountered species in North American gardens, though there are several others worth planting for their ornamental qualities. Virginia bluebells (Mertensia virginica) are part of a unique class of plants: spring ephemerals, the first plants to emerge after winter. They are native to the deciduous forests of eastern North America, where they are found carpeting the forest floor in March and April with their baby blue blossoms. The foliage appears even earlier, taking advantage of the sun available on the forest floor before the hardwoods leaf out. In keeping with their ephemeral nature, the leaves begin to shrivel in early summer and by mid-summer the plants are completely dormant, waiting underground until next year. Growing quickly on erect stalks up to two feet tall, Virginia bluebells emerge from the ground with a delicate, light green color that is very attractive when mixed with plants that have dark green foliage. The one-inch long flowers dangle from the top of the stalk in loose clusters. Overall the plants are taller than they are wide and look best when they are massed together in groups. 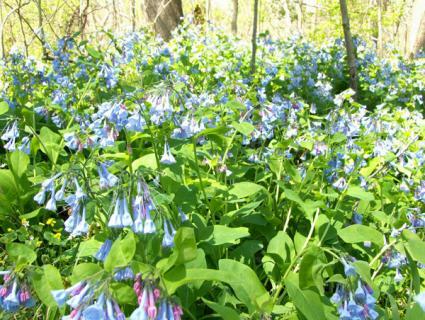 Virginia bluebells tolerate partial to full shade and require rich, moist soil. In nature, they grow in bottomland forests. They require soil conditions that are very wet in spring, yet well-drained, and this should be mimicked as much as possible when growing them in the home landscape. Combine them with other shade lovers that will hold the space when the bluebells make their summer retreat, such as ferns and hostas. They are tricky to start from seed, but Virginia bluebells are commonly available as transplants from nurseries. Early spring is the best time to put them in the ground, just as they are emerging from dormancy. In ideal growing conditions, they will spread themselves over time to colonize shady areas. They are not prone to pests and disease and require little care other than to make sure the soil stays moist. The foliage can be cut to the ground when it begins to turn brown in summer. 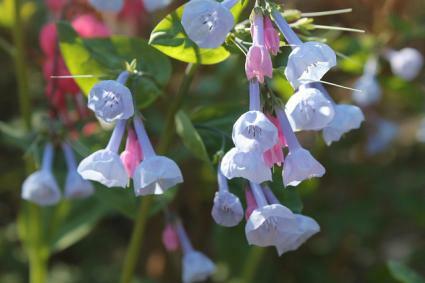 Mertensias come in a variety of forms that offer options for gardeners who lack the ideal growing conditions for Virginia bluebells. The arid western states are poor habitat for Virginia bluebells, but gardeners in these states can consider mountain bluebells which are native west of the Mississippi. They resemble their eastern counterparts in most respects, though they can grow up to three or four feet tall and have a hairy texture on the leaves. They like shade but are happy to grow in relatively dry, rocky soil. 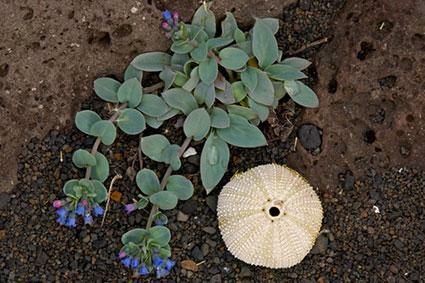 This plant has similar flowers to Virginia bluebells but is found in northern seaside locations, where it likes to grow in rocky terrain. It grows flat along the ground and has thick, succulent leaves that are edible, with a flavor reminiscent of oysters. They are difficult to grow in warm climates, but a potential rock garden plant for northerly or high elevation locations. 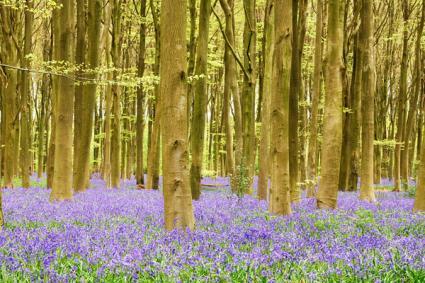 Bluebells are one of the first harbingers of spring, signaling to the rest of the forest that it's time to get growing. Though delicate in appearance, they are surprisingly tough and enduring plants once established.